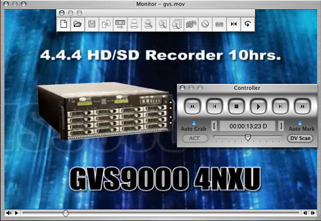 The GVS Tracker Software Solution (TSS) HD to DVCPRo HD Recorder, Digital Data Logger (DDL), Thumbnail Picture Generator(TPG), Digital Encoding Real-Time(DER), Automated Scene Detection(ASD) and Downloader for GVS9000 VTR Product Family), allows you to index an entire tape in just minutes based on the Date/Time information embedded in the video frame using the convenient HD-Scan clip detection feature. This feature allows you to create a regular log file with high-quality JPEGs and clip timecodes IN and OUT of video "on-the-fly". 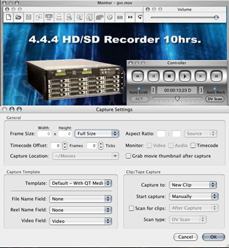 The HD-Scan feature also allows you to scan directly from your tapes using a FireWire connection, or scan QuickTime or MPEG HD media files that have already been digitized to your hard disk. Media logging is also available. For analog or non-HD material, the HD-DV Tracker software's Auto Capture Technology detects scene changes based on color and is hardware independent, integrating seamlessly into virtually any video-input workflow. To help expedite your editing process, HD-DV Tracker allows you to organize and personalize all your related video information, from text fields for notes and descriptions, to storyboards or reports for video-logging data. .
Log onto one platform, edit from another! Accessing logged information is essential to maintaining your video assets. One of the most important features of the HD-DV Tracker is it's flexibility. Users can share, store, and retrieve clips now and at any time in the future allowing for greater collaboration irregardless of which editor is being used and is cross-platform compatible. HD-DV Tracker imports and exports shot lists from all popular, non-linear editros, including Final Cut Pro, Avid, Optibase/Media 100, Adobe, Accom Spheres, and more.